Water is a most important environmental factor. It is essential for all life processes. The living cells have about 80% water. It is essential for the maintenance of turgidity of cells. It acts as solvent for the exchanges of gases. All physiological processes like photosynthesis. transpiration and respiration require water. Water covers about 73% of the surface of the earth. It is present in ponds. lakes, streams and oceans. Only I % water is present in fresh water bodies like ponds. river, lakes etc. 99% water is present in oceans. It falls from the atmosphere in form of precipitation, and water vapours. Precipitation includes rain, snow, hail and dew. Precipitation occurs due to condensation of water vapours present in the air. Air or wind carries these vapours from oceans. Precipitation may be in the form of rainfall, snow fall or hailing. The geography of the region and weather system determines the amount of rain fall. The air is saturated with water over oceans. It blows off the ocean. The air moves upward.There is low temperature there. The water vapours condense to firm droplets. Thus clouds are formed. When the diameter of the droplets becomes 1 mm, the rain starts falling. Raining occur towards the ocean facing slopes. The other sides of the slopes are called rain shadow. They receive no raining. Therefore they become deserts. Thus deserts are found behind high mountain ranges or near the coastal areas. Distribution of rain faIl over the year is an important limiting factor for the organisms. Rainfall is unevenly distributed over the year in the tropics and subtropics.They have well-defined wet and dry seasons. But rain fall is evenly distributed over the year in the temperate regions. Snow is also a kind of precipitation. Snow fall mostly occur on high mountains. There is a freezing temperature on the high -mountains. Therefore, water vapours are frozen to form snow. Generally, ten inches of snow is equal to one inch of rain. Snow deposits on the mountains and form glaciers. These glaciers have great importance for the hydrological cycle. They act as water reserve for whole of the year. Snow melts in the oceans. Its water drives the rivers throughout the year. Our irrigation system depends on these rivers. Snow may be harmful for plants. Its weight breaks off the tree branches. It can kill the saplings. Deep snow stunted the growth of plants. Some of the drops of rain solidified due to very low temperature (below O0c). They form hail stones. They fall on the surface of earth.Hail is not beneficial for the plants. It destroys different part of the plants. It destroys the seedling of the plants. Water vapours of air condense when it comes in contact with cold surface. The moisture condenses on the surface in the form small droplets of water. These droplets are called dew. Sometimes, the temperature of surface is below freezing point. Therefore, the dew drops freeze. Such frozen dews are called frost. It occurs in temperate regions. Dew adds water content to the soil. It also increases humidity. Dew has little effect on most of vegetations. But it has great effect in deserts. There is night cooling in the deserts. It causes heavy dew formation. This dew is important for plant life. Rain is a major source of soil moister for the plants. Rain increases the humidity of air. Thus it reduces the rate of transpiration in plants. It affects many physiological functions of the plant. The amount of rain determines the different vegetation zones. The deserts, grass lands and forest are formed due to different amount of rain. Snow is important for driving rivers. Snow may cause ice crystal formation in plant cells. It kills the plants. Dew has great significance for desert plants. Plants are distributed in nature according to amount of moisture available to them. Plants are divided into four groups in relation to moisture. 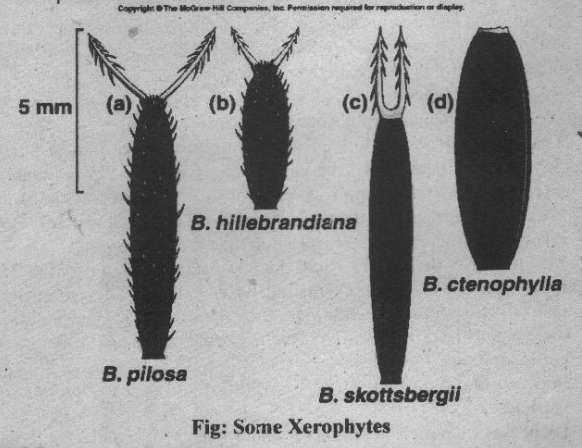 These groups are hydrophytes, amphibiophytes. Mesophytes and xerophytes. The plants grow in water reservoirs like ponds, lakes streams or rivers are called hydrophytes.These plants live in habits with abundance of water. They may be submerged hydrophytes. free floating hydrophytes. fixed floating hydrophytes. (a)Submerged hydrophytes: these plants are fully submerged in water. They may be rootless. Their stem is soft and tender. Cuticle is absent in them. Vascular tissues are poorly developed. Mesophyll of the leave is not differentiated into palisade and spongy. They have special type of stomata called hydathodes. Its example is Hydrilla. (b)Free floating plants: They are not anchored in the soil. Roots are absent in them. Hydathodes are present only on the dorsal surface. Its examples are wolffia, Pistia. (c)Fixed floating plants: They are anchored in the soil and their leaves are free floating on the surface of water. They occur in shallow water. They have well developed roots. The stern is present in the form of rhizome. Its example is Marsilea. The moisture loving plants are amphibiophytes. They grow on very moist and swampy places. These places are present on the sides of ponds. lakes and rivers. Their roots and part of stem are embedded in the mud. Most of their characteristics are intermediate between hydrophytes and mesophytes. They have well developed mechanical and conducting tissues. Their endodermis is thick walled. They have system of air space in the body. Their example is sagittaria. The land plants which grow in places which are neither dry not wet are called mesophytes. They are intermediate between hydrophytes and mesophytes. Many of the cultivated, ornamental and evergreen plants belong to this group. They have well developed tap root and adventitious roots. The stem is erect. The leaves are large with waxy coating. Stomata are present on the lorer.surface of the leaves. The leaves are dark green in colour. They readily wilt even in slight water deficiency. The desert plants are called xerophytes. They face the extreme shortage of water. They have following adaptation to reduce the rate of transpiration. (i). Many xerophytes posses small, thick leaves. It reduces the surface are proportional to volume of the plants. Thus it reduces the loss of water by transpiration. (ii). They have thick, waxy and leathery cuticle. (iii). The stomata are on the lower surface of the leaves. These stomata are present in depressions. (iv). Some plants like cacti shed their leaves during the dry seasons. Therefore, the transpiration is stopped completely. They have stem as their photosynthetic organ. Their stem store water in the rainy season and use it in dry condition. (v). Most of their body is composed of water storing cells. Such plants are called succulents.